We wanted to create a simple yet effective teaching and training prototype for EUS-guided biliary drainage using the 3D printing technology. 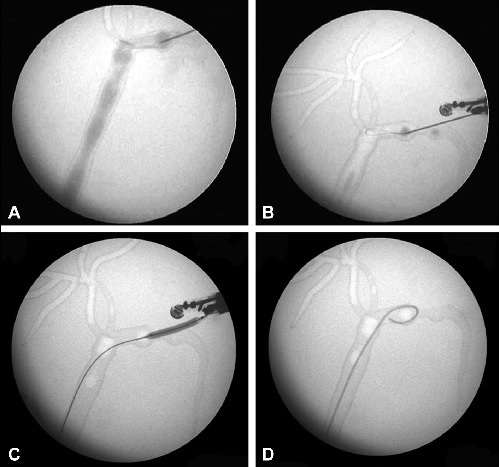 EUS-guided biliary drainage has emerged as an important novel method for endoscopic biliary drainage. Unfortunately, opportunities for learning are sparse, and there is no decent model to teach and train this procedure. We created this ex vivo model by stereolithography technique and wanted to test it with trainees and teachers. Figure 5. Radiographic images of the procedure. A, Contrast injection after needle puncture. B, A 0.032-inch guidewire being maneuvered toward the hilum. C, Balloon dilation of the tract with the guidewire in common bile duct. D, A pigtail plastic stent deployed. We found that both the trainers and trainees found the prototype very useful upon subjective and objective evaluation. The success rate for various steps of the procedures was very good (needle puncture and track dilation 100%, wire manipulation 82.35%, and stent placement 80%). The median score for overall utility was 4, and that for EUS view and x-ray view 5, out of a maximum of 5. These are encouraging results. However, we need to test it among a larger pool of trainees. One major drawback is the inability to use electrocautery. Further developments are required to create ex vivo models using 3D printing technology for training and teaching the various steps of advanced interventional endoscopic procedures.